While that first article explored what makes coaching truly transformational, I would like to show here how very similar principles apply to coach development, both in the progression from coaching to mentoring and supervision, and in the process of coach training and credentialing. For ten years, while training coaches in the Academy I had founded in Indonesia and Russia, I had wanted, without success, to add mentoring and supervision to our programmes. Finally, in September 2012, I began training as a supervisor myself, initiating an 18-month journey, fuelled by one question: how do mentoring and coaching supervision fit together? From the outset, I understood that supervision provides ‘reflective practice’ to support the overall development of the coach, while mentor-coaching is skill-focused, ideal for new coaches and those seeking to hone skills for a higher credential. But it took another 18 months to fully appreciate this difference. supervision to support the growth and development of both coaches and mentor coaches. To support development, whether our own or others’, it helps to understand how that process unfolds from cradle to grave. Individual trajectories through life may differ radically. But developmental psychologists generally concur as to the broad lines of development the majority of the population pass through, even if the higher developmental stages taken by the few are less well defined. Essentially, we can discern three main phases: pre-conventional, conventional, and post-conventional. In the pre-conventional stages, we tend to respond to the world in a reactive or impulsive way. In the conventional stages, we are capable of more cognitive complexity, and understand, accept, and fit into the give and take of social interaction. In the post-conventional stages, often arising in the second half of life, we transcend the boundaries of conventional thinking, free to be and let be, living life as it suits us and allowing others to do the same. ‘Change’ denotes the simplest kind of behavioural learning, where single-order feedback lets us know whether we are achieving our goal. Are we hitting the target? Do we need to adjust our aim? Up, down or sideways? As infants, we begin learning primarily at the change level, through trial and error. We try to do something and, from the feedback, adjust our actions until we succeed. This is how we learn to manipulate objects, feed ourselves, and walk. Such learning remains important throughout life – whether we want to bake a cake, drive a car, or improve a golf swing. It remains important when we need to remember an appointment, someone’s name or a new word through repetition or rote learning. Simple behavioural change continues to have a role in higher-order learning. As we become skilled at adjusting our behaviour, we discover how to do it better. We not only learn by repetition or trial and error, but by recognizing patterns and understanding how to improve our performance. We are now learning, not only by responding to simple feedback, but by evaluating that feedback, and adjusting our response to it. In such ‘double-loop learning’, understanding is central, interpreting and evaluating what we experience. As we learn how we learn, we identify our strengths and limitations, decide what we can and can’t do, and define our very selves to boot. 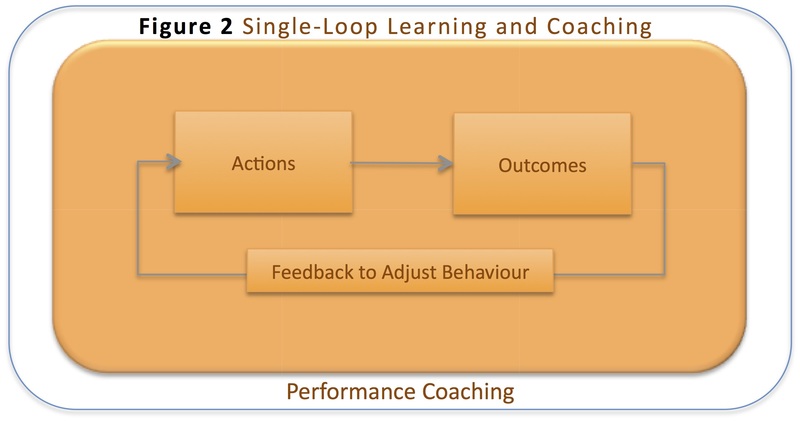 Arguably, single-loop behavioural learning is where basic performance coaching began. For example, Timothy Gallwey found that saying ‘bounce-hit’ internally reduces interfering inner dialogue and allows greater presence-to-stroke when playing tennis. [iv] Here, a simple (internal) behavioural shift enhances performance of basic strokes. Such behavioural learning remains an important part of our results and performance-oriented profession, as we help ‘design actions’, ‘plan and set goals’, ‘manage progress and accountability’ (Figure 2). Typically, novice coaches find it easier to focus on concrete behavioural goals to enhance performance, with single-loop learning essential in practising the foundation skills for initial credentialing. However, beginning coaches soon realize that the client’s attitudes, values, and beliefs affect what goals can be conceived and achieved. As a coach becomes more experienced, we expect him or her not to take the client’s request at face value, but to probe the underlying motivations and convictions shaping what is desirable, permissible, or forbidden to the client. And this is where there can be an important overlap between coaching and counselling, as our work with clients becomes transformational (Figure 3). As we mature as coaches, our clients mature too. We find them less interested in goal setting, problem solving, and realizing coaching outcomes, and more interested in the unfolding of who and what he or she can be. We find clients wrestling, neither with the challenge of achieving more, nor with resolving the beliefs and assumptions that frame and fence that achievement. The questions are less about what to do, how to succeed, or next career steps, and more about who and what am I? How am I both receiving and creating this life? And what does that mean for how this life can best unfold? Not what do I want to get, but how can I serve? In the post-conventional phases of development, there is a growing lucidity about, the whole process of making meaning, and a realization that the self unfolds itself to itself in a natural way. Client coaching questions address existential issues to do with the nature of selfhood. We touch the context of all single- and double-loop learning – the self itself. Such issues arise naturally in the coaching, as the coach’s own mastery and maturity grow. The developing coach, too, is also less focused on outcomes and their impediments, and more interested in the unfolding of the whole person. He or she naturally gives space for this process of becoming to ‘breathe’ in the client within and through the coaching relationship. As the boundaries of self become more permeable to both coach and client, there is room to receive the wider transpersonal energies of life in the spaciousness of self – or even what is increasingly understood as the deeper ground of self, the space beyond all ideas of individuality. 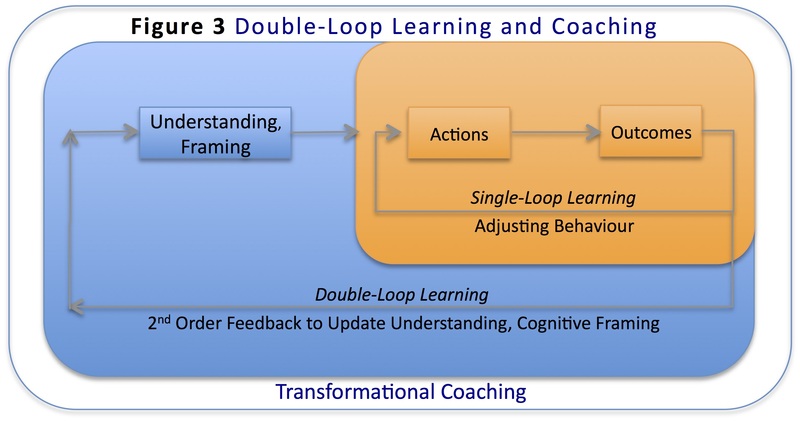 It seems clumsy to describe this development as ‘triple-loop learning’, but that is what is happening – not simply feedback on the success of a behaviour, nor understanding about the whys and wherefores of this feedback, but recursion to the very context of that feedback, what we have assumed about the nature of the one making and responding to that feedback. Coaches with a counselling background may well feel more comfortable in coaching that touches these deeply transformational higher orders of development (Figure 4). These three levels of learning and coaching correspond to a shifting focus from ‘what’, to ‘how’ and ‘why’ (or ‘why not?’), and thence to ‘who’ (Figure 5). The emphasis shifts from object or objective ‘what’, to the process of reaching the object and what might be interfering within or without the client (how and why/why not), and thence to the subject (who). In other terms, the focus shifts from the known, to the process of knowing, and thence to the knower. 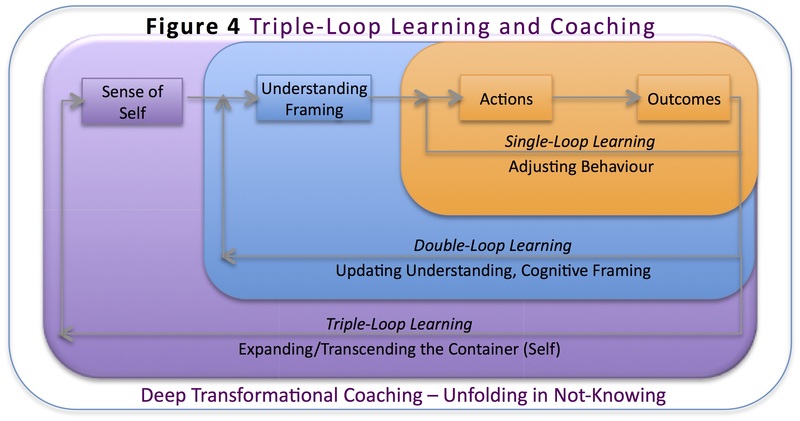 These three broad spheres of unfolding correspond, roughly, to the triple-level coach credentialing espoused by a number of coaching organizations. Where new coaches have a previous counselling or therapeutic background, with substantial professional training and development, they may have already experienced a similar progressive focus on change, learning, and growth. But where new coaches do not have this background, the more limited training on offer needs to progress them through these levels as well as possible. The approach taken by the world’s largest coaching credentialing body, the International Coach Federation (ICF) fits with this view. In the ICF model, a new coach approaching the entry level credential (ACC) logically first acquires basic coaching behaviours, and coaches more at the behavioural level, taking the client’s request at face value, focusing on the client’s request, what to do in the coaching, and what the client needs to do to achieve the coaching outcome. Development towards the PCC credential implies integration of basic skills, more focus on the wider implications of the client’s request, both for its possible impact and for what may support or interfere with its attainment. 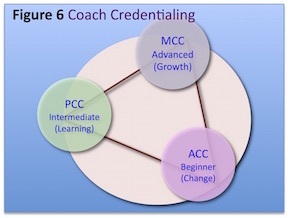 With growing mastery towards the MCC credential, coaching becomes less about what the coach needs to do, and more something effortlessly happening through the coach. Coaching resembles a conversation rather than a structured process. Structure there may be, but flowing naturally and organically. 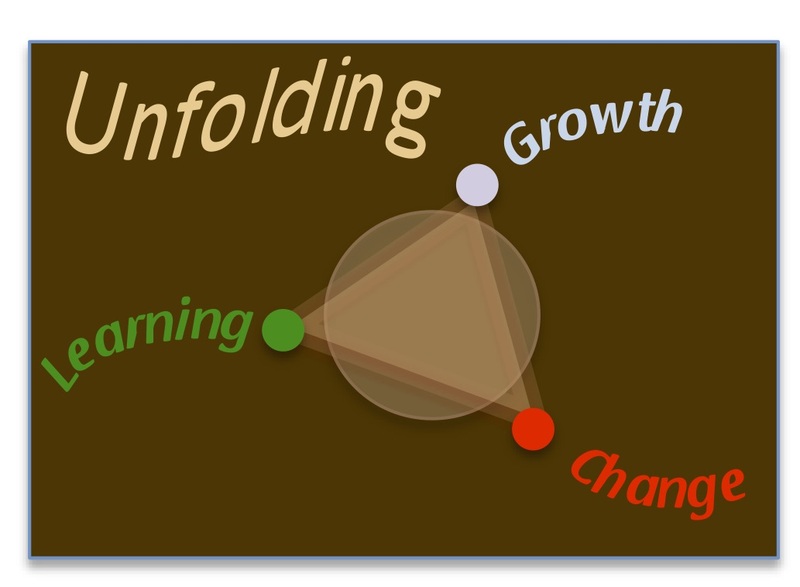 There is less trying to master the process and more allowing the process to flow or unfold (Figure 6). A similar relationship holds in how coaches are developed. Initially, the focus is on making sure that the coach knows what to do, and to some extent how to do it. At this stage mentor coaching, with its focus on helping the coach really refine that ‘how’ is particularly appropriate. As the coach matures, supervision supersedes mentor coaching, as we include the ‘who’, embracing the coach, the coaching, and the client. The supervisor’s awareness becomes a receptacle for many facets of the coaching process – including the client and the client’s aspirations, and how these are impacted by the coach’s own development, as the relationship between coach and client unfolds. As such, supervision may touch the appearance of issues at the border between coaching and therapy in the supervisee’s work with clients, as well as the parallel appearance of such issues in the relationship between supervisor and supervisee. Inevitably supervision touches the unfolding of who the coach is as a person (Figure 7). And supervision therefore also presupposes continuing growth and maturation in the supervisor. Such growth is necessary for the supervisor to hold the space for exploring what is happening in him- or herself, as well as in coach, client, and the coaching and supervisory relationships. In holding such a space, the supervisor creates a context for the deeper wisdom of life to emerge naturally in the process of supervision. At the same time, he or she is modelling the way in which a similar flow of wisdom can become present in the space between coach and client. This does not mean that mentor coaching is appropriate only for new coaches and supervision is only useful later, but as the coach develops the needs and emphasis shift from a greater focus on skills to a greater focus on the development of the person as a whole. 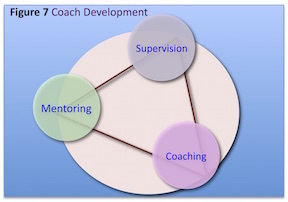 If these connections are valid, they suggest a natural progression from developing skills as a coach, to mentor coaching, and eventually to coaching supervision, even if not all travel the whole path. For those who do, the full path of coach development will include mentor-coach training and eventually supervisor development. Coaching supervision programmes have developed on the margins of the main coaching organizations. And even where mentor coaching is emphasized for coach development, expectations around how mentor coaches are developed also remain relatively unformalized. There is, as yet, almost nothing for mentor coaches corresponding to the programme certification and personal credentialing of coaches. This part of the profession remains where coach development was a dozen or more years ago. A search for ‘mentor coach training’ brings up generic coaching and mentoring trainings, rather than specific mentor-coaching programmes. These appear rare, though I understand Janet Harvey offers one in the US. A programme with such elements can provide a strong foundation for quality mentor coaching, as well as for development as a coach supervisor. Coaching supervision training can add further depth and complexity, as best current practice already does. This allows mentor coaching and supervision to complement each other as integral parts of a developmental framework, strengthening coaching as a genuine, maturing profession. Should Coach Supervisors Become Mentor Coaches First? An interesting question is whether mentor-coach development should be a prerequisite for training in coaching supervision. My own supervision training did not presuppose mentor-coach training or experience. And the latter did not appear indispensible. I observed participants gaining and growing enormously through the training. I felt most of the coaches attending the training would make excellent supervisors and become even better coaches. However, I found the experience I brought initially to coaching supervision somewhat lacking. In spite of ten years’ experience training and developing coaches. I felt my limited mentor-coaching experience held me back. Developing mentors and practising mentor coaching more thoroughly with my coaches has taught me much more about the ‘how’ of coaching. And that has made me more ready to conduct supervision that embraces the coach – the who – without neglecting or ignoring the what, the how, and the why and why not of coaching. Perhaps mentor-coaching skills are not essential for supervision, but I believe they make for a better coaching supervision. Could Counsellors Supervise Without A Prior Coaching Trajectory? Another interesting question is whether a counselling background might prepare one for supervising coaches. My experience suggests that counsellors might valuably make the transition to coaching supervision with a substantive training in the latter, but this transition would be more natural and complete with some background experience in coaching and mentor coaching. A dual coach-counselling background can provide a particularly rich foundation for the holistic whole-person focus of coaching supervision. As the coaching profession matures, I suspect the logical pathway will be from client, to coach, mentor coach, and ultimately supervisor. Such progression fits closely with how we change, learn, and grow, in the unfolding of who and what we ultimately are, both individually and collectively. It fits with how we struggle pre-conventionally to find our way in the world, then jostle with the conventions of adult life, before maturing into a ripe post-conventional, self-actualizing human-being – at ease in his or her humanity, while realizing he or she is an instrument of the mysterious and sacred spirit of Life, living and breathing through each and all of us and all of this. Person Centred Expressive Therapist, Deep Transformational Coach, Mentor Coach, and Certified Coach Supervisor (CSA). Peter is founder of Nirarta Centre for Living Awareness in Bali and founder of the International Academy for Deep Transformation, offering two ICF ACTP diplomas in Deep Transformational Coaching and training in mentor coaching. [i] Wrycza P. What makes coaching truly transformational? Coaching Today. 2014; 11: 11-15; Developing People who develop people: coaching, mentor coaching, and supervision, Coaching Today. 2015; 15: 22-27. [ii] Bateson G. The logical categories of learning and communication. In steps to an ecology of mind. New York, Ballantine Books; 1972. [iii] Ardui J. Wrycza P. When performance meets alignment: a compass for coaching and mentoring, Hertford, AuthorsOnLine; 2005.